Saturdeay June 22nd 1895 I got my work done in a little while this morning and worked some on my dress before dionner. Mother and Robbie came out to spend the day. We had such a quiet nice day. Will was in town for things. Oliver hoed the garden all nicely. Will and I put out some cabbage plants after supper. Sunday June 23rd 1895 It looked like rain and we did not go to church. It was brighter in the afternoon and we went over to Marys a little while. We stopped at home too. found Hattie not at all well. Did the evening work. Oliver was down with us in the afternoon but went back in the evening. We were tired and went to bed early. Monday June 24th 1895 The boys helped me today and I got the sitting room carpet taken up and cleaned. I swept the rest of the house down stairs and feel glad it is all done. 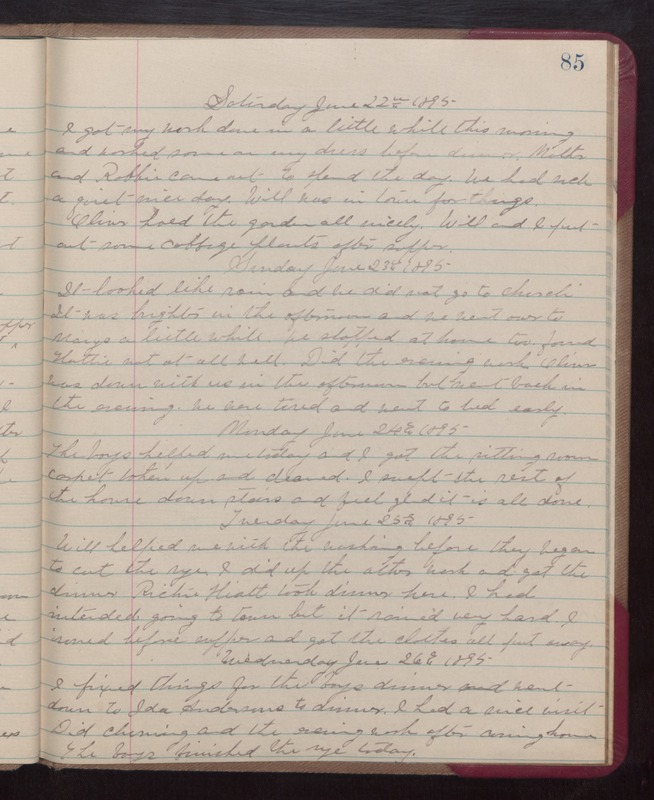 Tuesday June 25th 1895 Will helped me with the washing before they began to cut the rye. I did up the other work and got the dinner. Richie Hiatt took dinner here. I had intended going to town but it rained very hard. I ironed before supper and got the clothes all put away. Wednesday June 26th 1895 I fixed things for the boys dinner and went dome to Ida Andrersons to dinner. I had a nice visit Did churning and the evening work after coming home. The boys finished the rye today.